Myself and Rich are just back from a fantastic skiing holiday where we stayed in the most lovely chalet with a group of friends and spent our days falling over and eating. As promised I took some craft supplies on holiday with me in the hopes that I would find some time to do a little crafting while away. 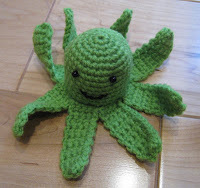 In the end I decided that crochet would be the most portable, and I did manage to find a little time in the evenings to whip up a little amigurumi octopus for one of our ski friends. I've finished writing up the pattern for him this evening so if you fancy trying to make one too the pattern is now up on the Crochet Me website. I also had a good bash at trying to make a little crochet whale - but I'm sorry to say that he did not turn out well at all. However, after checking up on a few of my favorite blogs today I found that another crochet blogger has also come up with a pattern for a lovely little whale! Once I've finished up sorting through my suitcase I'm going to give him a go instead.